On November 10, 1975 the SS Edmund Fitzgerald, one of the largest freighters on the Great Lakes, was trapped inside thirty-foot waves in Canadian waters. The final radio report from Captain Ernest M. McSorley was optimistic: “We are holding our own.” A few horrendous minutes later The Fitz was dispatched to its tomb at the bottom of Lake Superior in 530 feet of water. Its grave is a mere seventeen miles from Whitefish Bay. Search and rescue efforts were immediately mobilized. Initially the SS Arthur M. Anderson and the SS William Clay Ford were the freighters on the scene. American and Canadian authorities were rapidly involved, but nothing was recovered except for lifeboats and rafts; all twenty-nine members of the crew perished. It remains the most famous disaster in the history of Great Lakes shipping. 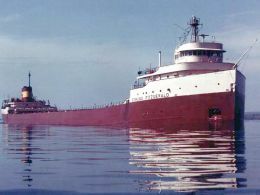 In 1957 Northwestern Mutual Life Insurance Company of Milwaukee, Wisconsin contracted Great Lakes Engineering Works of River Rouge, Michigan to design and construct a bulk carrier laker. It was christened and launched on June 7, 1958 and named after the Chairman of the Board and President of Northwestern Mutual Life. Edmund Fitzgerald’s father had been a captain on the Great Lakes. It wasn’t long before sailors tagged it with nicknames that fit: Mighty Fitz, The Fitz or The Big Fitz. For seventeen years Mighty Fitz carried taconite from the Mesabi Iron Range region of Minnesota to iron mills in Detroit, Toledo and other ports. Mighty Fitz had a few mishaps on her journeys. In 1969 she ran aground and then in 1970 she collided with the SS Hochelaga. Later that same year and again in 1973, The Fitz struck the wall of a lock. 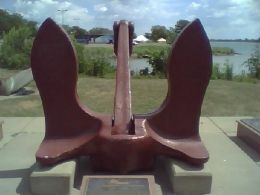 A notable misadventure occurred in 1974 when she lost her original bow anchor in the Detroit River. It was salvaged and is now on display at the Dossin Great Lakes Museum in Detroit, Michigan. 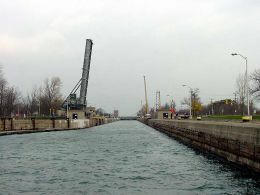 Growing up two hundred yards from the north shore of Lake Erie meant that large chunks of my boyhood was spent watching freighters and ocean vessels through binoculars or up close at Lock 8 of the Welland Canal at Port Colborne. The big ships came from faraway places or were heading to some destination that would nip at my imagination. There was an excitement and innocence in dreaming about where they’d been or where they were going, which most certainly contributed to the wanderlust rooted in my soul. The allure of the Great Lakes and kinship with the maritime life was strengthened by the lore and tall-tales from those neighbors and family members who worked on the boats. When contemporaneous news accounts about the tragedy on Lake Superior came across the airwaves via CHOW Radio in Welland, it galvanized our community. Though we were five hundred-some miles southeast of where The Big Fitz went down, we were gathering debris and cleaning up from the storm. At our house phone calls were made to check on the whereabouts of one my cousins because he had done a tour on the boats that summer. No one was quite sure if he was finished for the season. Turned out he was safe at home, so that was good. 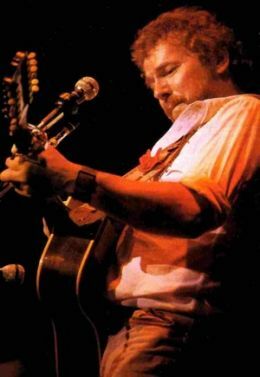 In the spring of 1979, at a Massey Hall concert in Toronto during his Slow Train Coming tour, Bob Dylan referred to Gordon Lightfoot as “one of Canada’s national treasures”. A true statement to be sure. Lightfoot’s brilliance and staying power has resulted in a catalog of over two hundred recordings. There is not a sour note in his lexicon, but he was never better than when he chronicled the loss of the Edmund Fitzgerald in a song based on facts culled from an article in Newsweek magazine. In long-accepted folk tradition, its tune and rhyming structure have their origins in an Irish ballad. 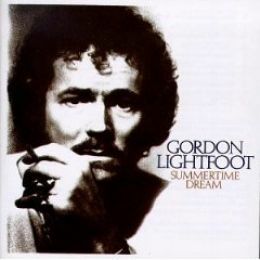 The Wreck Of The Edmund Fitzgerald originally appeared on Lightfoot’s 1976 album Summertime Dream. Later it was released as a single that reached number two on the Billboard pop chart. It continues to get considerable airplay on many stations, especially “when the skies of November turn gloomy”. One lyric haunts the song: “Does anyone know where the love of God goes when the waves turn the minutes to hours?” It is an echo of a query that has been voiced at each misfortune or catastrophe since the dawn of time. For example: When his achievements were reduced to a legacy of dust, an Old Testament character named Job demanded an audience with God to argue his case. Job wanted to ask God a variation of Lightfoot’s question; he wanted God to explain where he was in the midst of calamity. From out of a whirlwind, God spoke in a forthright directness that remains riveting today. God’s soliloquy peeled back multiple layers of his sovereignty to reveal the totality of humanity’s ignorance. From antiquity to the twenty-first century, nothing much has changed in the arena of our ignorance: Technology has made light-year advances, but grasping the intricate and infinite purposes of our Maker are still shrouded in the rags of human-centric reasoning. While we are on this side of eternity we expect explanations to all our existential quandaries, but the heavenlies are teeming with complexities and secrets unknown to us. Comprehension of the whys and wherefores of the Almighty’s judgment is beyond our capacity to reason or understand. The One who created the universe out of nothingness is God; despite our illusions and aspirations to the contrary, we are not him. Horrific scenarios happen with no particular or all-encompassing significance; they are merely the bleak byproducts of a sin-infested world. Where does the love of God go; where is God in the oft-times harsh reality of life? Having experienced some circumstances where metaphorically speaking the waves turned the minutes to hours, it is my contention that God is ever-present. The task in those moments of cataclysmic sorrow is to embrace the mysterious nature of God. It is a courageous act of faith that is necessary for wholeness; it cultivates humility, which helps to put all the uncharted gales that come along into a properly aligned God-centered perspective—truth is, his love endures forever and his tender mercies are new every morning. Ken’s stories have always inspired me from when he was 16 telling a story at a campfire to great effect. His use of words paints the word pictures as he draws out his story on the canvas of your mind. I love Ken’s writing not because I was his teacher or could take any credit for his writing. (I was his science teacher, not related at all to the stories he tells 🙂 But because HE inspires me! He deserves to be more well-known and my prayer for him is that he will be. If you have not read any of his series of novels found on Amazon.com, you do NOT know what YOU have missed!